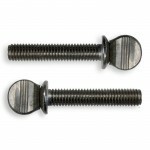 Gamma Thumb Screws with Shoulder are cold formed in plain and zinc plated steel, brass and stainless steel A2 (AISI 304) and A4 (AISI 316). 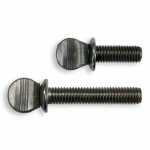 They are available with metric thread, American Standard (UNC and UNF) and Whitworth (BSW and BSF). Cold formed in steel, brass, stainless steel AISI 304 (A2) and 316 (A4).